The Office: "Threat Level Midnight"
Personally, I thought Threat Level Midnight as used in “Threat Level Midnight” was a mixed bag. On the one hand, some of it was really clever: The difference of opinion regarding the humanity of Dwight’s character and Darryl’s pre-Obama Presidential aspirations were both quite funny, drawing attention to the passage in time and using it to their comic advantage through some clever talking heads. However, by comparison, Michael’s juvenile response to Holly’s general lack of love for the film and the idea that everyone had to tiptoe around Michael by taking the film seriously were less effective. The Dwight and Darryl storylines invigorated the episode and brought the film into our world; the Michael and Holly storyline was an excuse to break away from the film and introduce some level of plot into the episode, a plot which never actually went anywhere and thus ended up feeling more forced than it needed to. As for the moments when Threat Level Midnight was just allowed to play out for a while, I thought it was solid. Stanley as a Morgan Freeman sound-a-like narrator was a lot of fun, and revealing it was actually Michael at the end felt like something Michael would think was clever. Similarly, I liked Michael’s fantasy scenario wherein his character was married to Catherine Zeta-Jones*, even if the Armageddon parody in the flashbacks transposed onto the hockey puck felt overdone (and were an obvious stretch of his filmmaking abilities). The movie’s value, at least for me, was in seeing an extension of how Michael Scott thinks: Take, for example, the moment where he has Toby’s head explode numerous times in order to play out his grudge against the character. 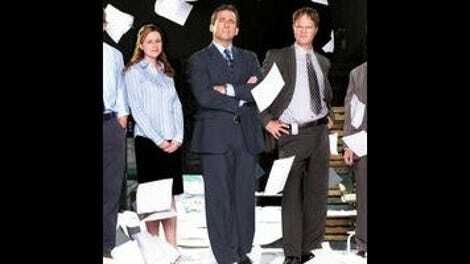 While the movie was clearly not something that Michael Scott could have made and raises a whole host of logistical questions, this felt like the kind of movie that Michael Scott would make if he could actually convince everyone in the office to take part, get the resources to make it work, and somehow manage to film it without the process ever being mentioned before this point. *In case you were wondering, Catherine Zeta-Jones was in the initial script—I went back to watch “The Client,” and B.J. Novak was careful to remain true to the source material. The one major change seems to be the shift from a bumbling sidekick to an Alfred-esque Butler character in regards to Dwight/Dwigt. While I know that some have complained about my focus on the “Michael Scott Farewell Tour” in previous reviews, we can’t pretend that this wasn’t the most overt example yet. The movie can very much be seen as a history of Michael Scott’s time at Dunder Mifflin, a chance to see how much has changed since the show began. Just look at the shift in Michael Scarn’s character from the original screenplay: Once about a lively FBI agent, the story has shifted to Scarn as a retiree returning to the game, a change we can view as Michael having come to terms (to some degree) with his growing age. You can even see how Novak built that idea into the episode’s conclusion, wherein Michael’s juvenile behavior is eventually overcome as he comes to realize that his movie is so stupid it’s sort of funny and starts to accept the laughter as a natural part of the process. It’s there where the episode loses me. I’m fine seeing Threat Level Midnight as a meta sendoff for the character: It doesn’t make sense that Roy, Jan, or Karen would agree to be involved in the project at the times it appears they were involved (unless Jan’s love for singing in public overcame her crippling disbelief in Michael’s dreams), but I’m willing to accept that as an excuse for Steve Carell and Co. to work with David Denman, Melora Hardin, and Rashida Jones one last time. When it’s confined to the movie, it’s actually quite easy to just accept it and move on. While I wish more of the movie had seemed as home-made as Michael’s do-it-yourself montage of headlines early on, Threat Level Midnight emerged as a writer’s room indulgence without necessarily losing sense of Michael’s authorial voice. What made less sense was the conclusion. While I was pleased to see that Michael eventually comes to his senses, he’s blindingly ignorant throughout most of the rest of the episode. There’s a lot of “Classic Michael” here, especially in his reaction with Holly, and yet for it to be all smoothed over so quickly felt incredibly abrupt. It’s an exaggerated way of trying to suggest the character has changed, presenting him at his most unreasonable before revealing that, in fact, he’s perfectly capable of accepting criticism and admitting that his movie doesn’t completely make sense. That epiphany seems like a forced conclusion: Give it a voiceover, and it might as well be a Modern Family resolution, almost moralistic in its romanticization of the character. As some of you well know, that’s who I want Michael Scott to be. I want him to be reasonable, and rational, and to be able to see his own life with some sense of clarity. However, you can’t force such a transformation in a single episode, and you can’t throw his relationship with Holly under the bus in order to make it happen. It’s inconsistent with other episodes in the arc, and it felt like it was trying to do too much with too little. This one was all about Threat Level Midnight. “Threat Level Midnight” very much depends on what you want from this show and how you view the series’ trajectory. For some, the view back was an exciting bit of nostalgia, a chance to see some familiar faces and see an easter egg expanded into a reality. For others, I imagine that the episode only reminded you of how far the show has fallen, as a storyline which once had a real purpose for character and storytelling has been reduced to a glorified, impossibly elaborate viral video. And while it may seem conveniently neutral, I sit somewhere in between. I see all of the concerns about the video and the way in which it stretches the show’s reality, but the actual content of Threat Level Midnight was successful in more ways than I had expected. It’s not even, but it wouldn’t be even, and enough of the randomness seems distinct to Michael’s character that I consider it a worthwhile detour into the space where The Office and the office within The Office collide. “Don’t listen to your critics—listen to your fans.” I don’t know if this was intentionally aimed at those who have questioned the show’s quality recently, but in an episode this aggressively meta I think reading it that way is sort of unavoidable. It seemed there was an opportunity to bring the film crew into this, perhaps with Michael revealing that he had hired parts of the film crew to make the movie on the side or something like that. But since that would have raised a whole host of other logistical questions, it wouldn’t be worth it to solve the loophole. And yes, this paragraph makes the show’s mockumentary conceit sound like time travel on Lost or something. I know the show isn’t exactly serialized, but Gabe’s absence and Andy and Erin’s camaraderie does play super weird after last week’s episode. That said, I did enjoy Andy embracing his inner thespian in Threat Level Midnight. It’s a brief little beat, but the disturbing Helene cleavage moment and Pam’s reaction to it were nicely played. Note that Threat Level Midnight used to be Threat Level: Midnight back in “The Client.” Apparently, Michael’s opinion of colons has changed since season two. It appears that Michael’s lengthy edits paid off for at least one character: Kevin went from “two thumbs down” in “The Client” to “best movie ever” here. I know “It’s way better than Antz” is a very qualified endorsement, but still nice to see some love for A Bug’s Life. Have never understood the way the flack the film gets: It's not Pixar’s best, but it’s a lot of fun. Based on the calendar pages, the scene featuring them was either shot in 2007 (when February 10th last fell on a Wednesday) or shot in a year where Michael had a 2007 page-a-day calendar on hand. I guess we'll have to wait for the documentary on the DVD to find out for sure. “Oh yeah, I guess I did let him be a robot." The Office: "St. Patrick&apos;s Day"